McCourt Construction is an expert in the complex scheduling, safety, and security concerns associated with building at an airport. We have worked at several airports throughout the northeast since the 1940’s. 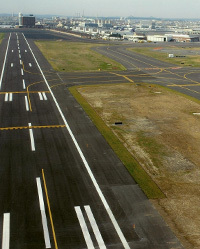 McCourt has built or rebuilt every taxiway, runway and apron at Logan International Airport – New England’s busiest air hub. In addition to airfield construction McCourt has installed fuel farms, built ferry landing docks, constructed rip rap barriers and seawalls, erected training facilities, and installed security systems. For an example McCourt Construction’s airport experience, please see our project page for the construction of runway14-32.